Here's what one shareholder has to say about holding on through the ups and downs of this incredibly successful stock. This piece was updated on Jan. 8, 2018, and originally published on June 26, 2016. Amazon.com (NASDAQ:AMZN) has an impressive stock price history -- perhaps one of the greatest over the past two decades. After accounting for three stock splits, Amazon's shares have advanced from $1.50 in May 1997 to near $1,250 today -- a 83,400% return! But you'd be hard-pressed to find anyone -- outside of founder/CEO Jeff Bezos -- who has been able to hold onto their shares for the entire ride. The stock has had its fair share of massive sell-offs. Consider what it would have been like -- emotionally -- to not sell during the following periods. While the 94% drop correlating to the dot-com bust looks painful, it's important to remember that Amazon was hardly alone in tumbling during the period. What -- to me -- seems particularly impressive would be if someone had held onto shares of Amazon during the 35-month period starting in 2003. It could not have been fun to see a stock in one's portfolio losing value over such a long stretch. Here at The Motley Fool, we are lucky enough to have someone who has held Amazon through all of the aforementioned ups and downs: co-founder and Chief Rule Breaker David Gardner. He recommended and purchased shares way back on Sept. 9, 1997, for a split-adjusted $3.19. An initial $11,000 investment would now be worth almost $4.3 million! It's mostly looking at the business, not the stock. ... I think a lot of the world doesn't think about things that way. Every time I watch financial television ... I'm reminded again of how people are thinking too much about stocks; wigs, wags, and short-term moves, and they're not really looking at the business. 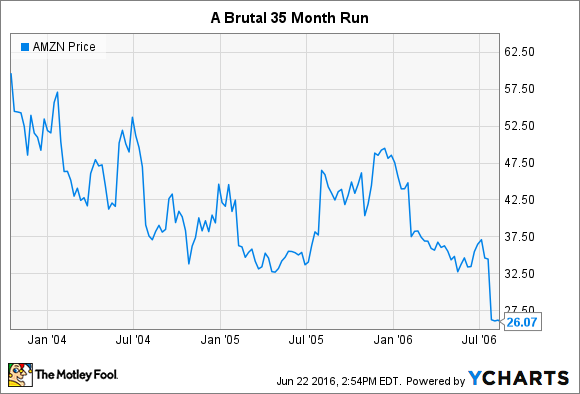 While Amazon's stock dramatically declined over that, the business did not. And therein lie many of the most important lessons any investor can learn: Invest in businesses, not stocks; keep holding them so long as the business -- not the stock -- continues performing in accordance to what you're comfortable with; be patient and steady. Back in 2013, we made a big deal of David's original recommendation reaching 100-bagger status. In other words, his $11,000 investment grew to $1.1 million. What hasn't been talked about nearly enough is the fact that in just four years, it's already become a 300-bagger! 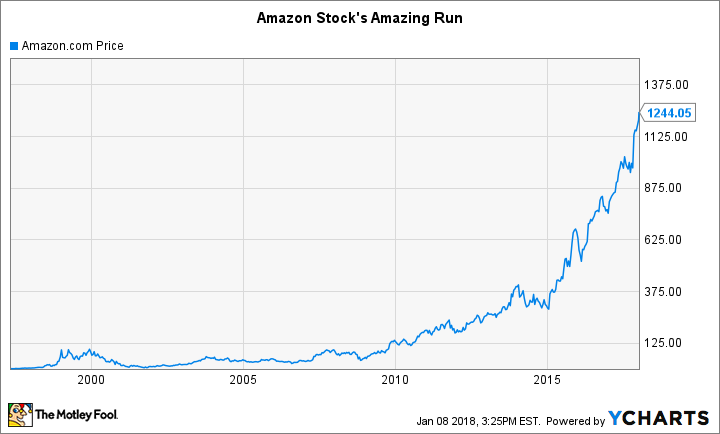 If Amazon ever becomes a trillion-dollar company, you'll be reading about a 830-bagger; that's an accomplishment that you might only see once or twice during your life.